We last spoke with iamstatic back in October of 2017, and today we catch up with David Greene, Director / Partner at IAMSTATIC, to learn about some of their recent projects, including BMW stunts on the salt flats, a backwoods scene that is not going to end well for one person, and horse racing that plays out on wallpaper! Read more about IAMSTATIC’s latest animation projects! 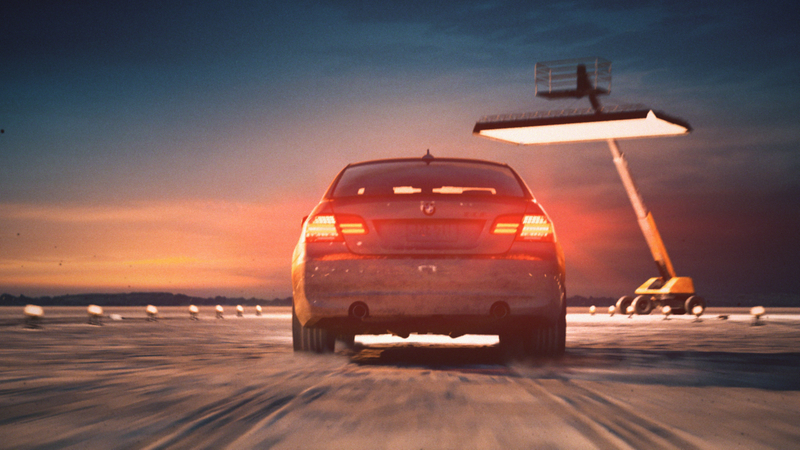 This campaign shows a BMW pulling an awesome stunt out on the salt flats, and everything (other than the HDRI sky) was fully CG. How did you create the salt? We treated the salt flats much like snow. We made a few procedural textures and used Corona Displacement, which let us control the patterns found in the environment for each shot without having to reinvent the wheel each time. The car model is exceptional! Did you model it in-house? And how did you texture it so realistically? The model is a mix of optimized CAD data, and custom modeling for parts that needed more attention, like the wheels and brake pads for closeups. There’s a lot of high speed motion in the piece, did that bring any challenges in terms of rendering? How did you create the awesome evening lighting in the scene? This was an interesting thing for us. We always see cars in the salt flats rendered with big bright sunlight washing everything out. We wanted to approach it differently this time. We opted for a night/evening approach, and initially it was going to be completely at night. In the end, we settled on dusk so that we could see more of the environment. It was lit with an HDRI of an evening sun and sky, coupled with a Direct light to give us a bit more strength from the sun direction. The rest of the lighting was all reproducing photography lights and car lighting, really much the same as if we were there filming an actual car. 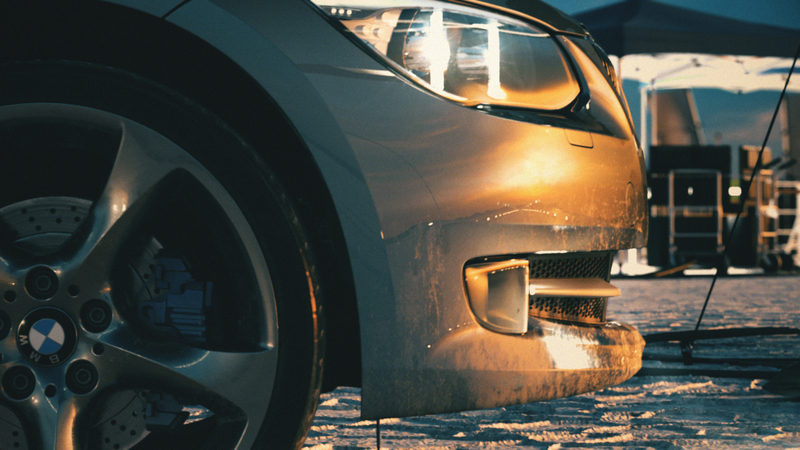 Headlights and brake lights are always a challenge – any tips on creating those so realistically? The first thing is to make sure all the geometry is there. We don’t like faking the lights of cars, so all the metals and reflectors have to be there. Then it’s just a matter of assigning a few Corona light materials / Corona lights the correct objects. For the headlights we usually use two lights for each one. One light to give us the wide spread, and a second to give a more focused beam to break up the uniformity of it all. One or both of these lights will usually get a IES profile assigned to help it even further. But it is pretty straight forward process. In what ways did the unique features of Corona Renderer make things easier? For features like LightMix, we usually use it during our pitching phase to play with look development. Corona Renderer just strikes the right balance of getting unnecessary controls out of the way, and I love how easy it is to set up in the render panel. How much post processing was done? The raw renders out of Corona have made our compositing a lot faster because what we get of the render is so nice. But we do always separate out the render elements and run all our CG stuff through Nuke to tone and tweak reflections, refractions and such, just to give things a boost here and there, or sometimes to lessen effects where needed. The VFX work like Tire tread displacement and Dust and smoke was done as a separate pass so we could control it a bit better in post. 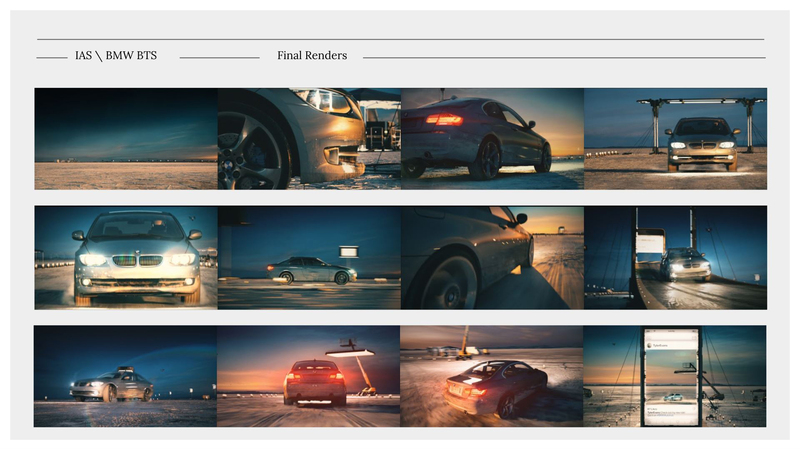 Once that is done and we are happy with the CG renders, it goes into our Edit for final color grading and lens effects. I love all the little details like the drones taking the footage! Did it take a lot of time to add those? What was the workflow in terms of storyboard, test renders (and getting client approval for those), final renders, and color grading? Everything we do is storyboarded out and styleframes done to get client sign off. The styleframes become a sort of visual contract that everyone can refer to as the project takes place. Once the story boards are approved, a quick edit is made from them so we can see what shots are working with each other, then it’s straight to previs to block out the CG. When you landed the job, was the story and idea already spelled out in detail, or did you have input to that? For this job there was an initial brief (which was very cool) and we helped expand how this idea could take place. What kind of cameras would shoot this, what is in the environment , what is the lighting…that sort of thing. 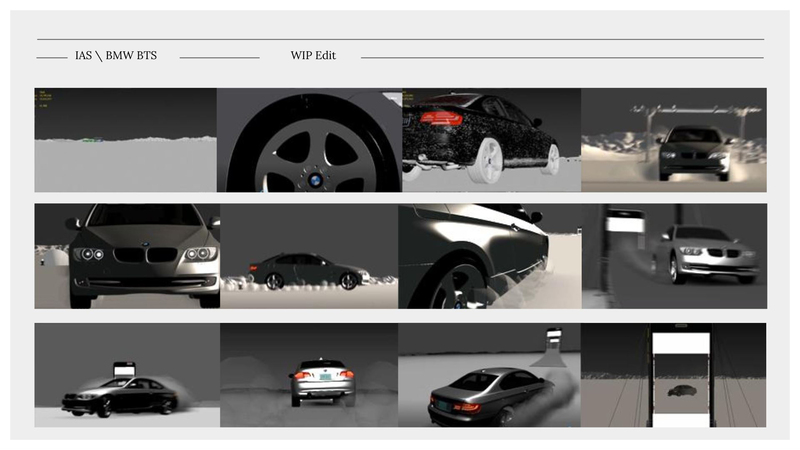 Just like the BMW project, you’ve built a whole CGI environment here! What tools did you use? We used Forest Pack for the scattering of all the objects here. (I truly love that plug-in. It can be used for so much more than just scattering trees and rocks around). Most of the assets are just from our library over the years. Everything is a mix of custom assets and purchased things from sites like TurboSquid. The car is a great example of that. 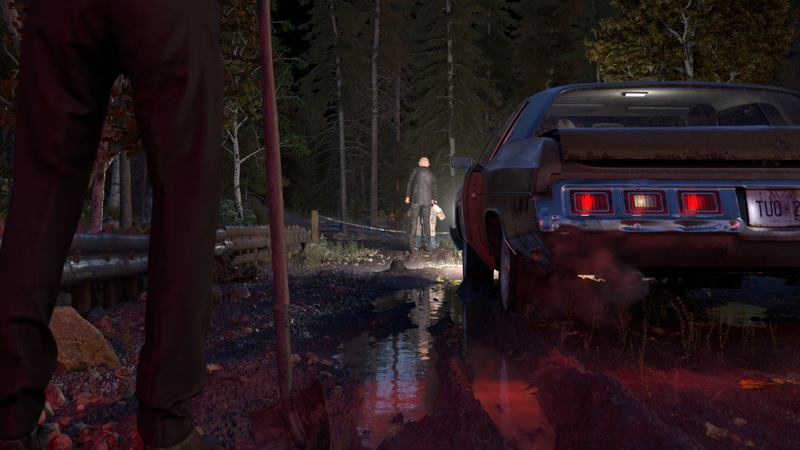 We took a TurboSquid model of a clean, perfect Impala, then we banged it up, re-textured it to look like it has been through some rough times and added the detail needed for brake lights and any close up objects. We do use the Corona AO map set to “inside” to get the edges of objects to mask worn out looking scrapes and bumps. 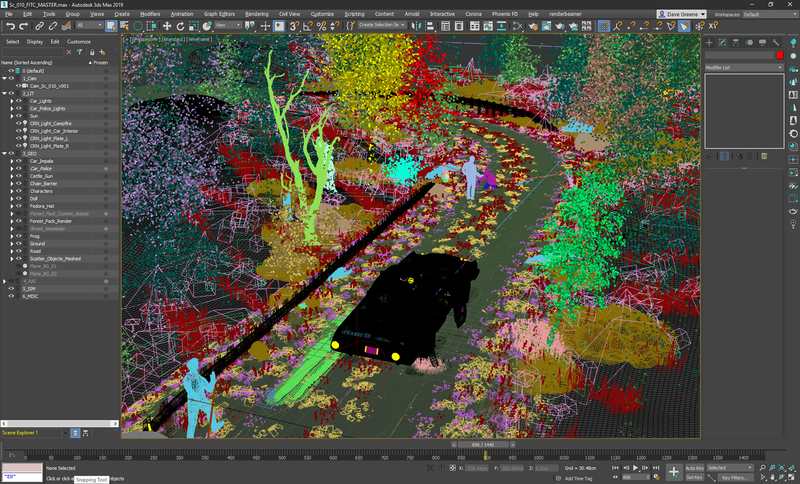 This scene actually started out as a test file working on a mixed wet and dry road during some downtime after the BMW spot. 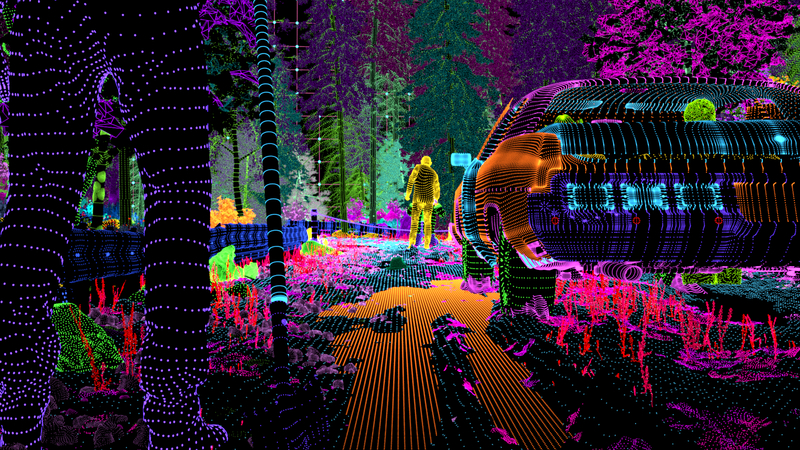 As this test scene started to show promise we made it look like a place we have been to up north in Ontario Canada. From there we gave it a little narrative and rolled with it. 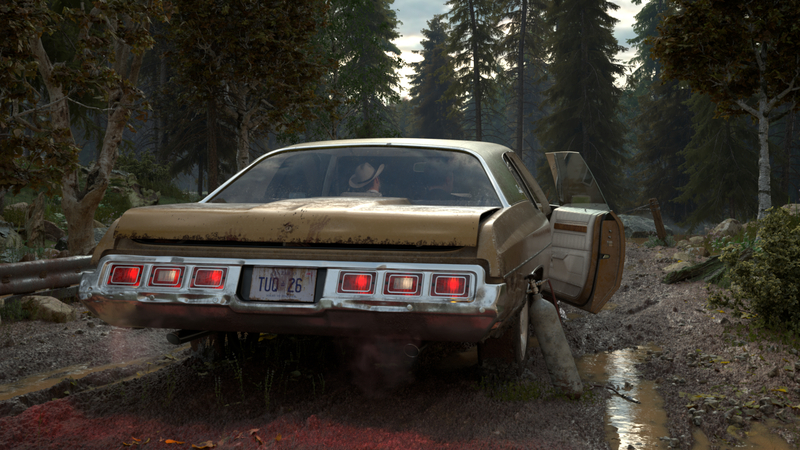 How did you create such a worn look to the car textures? This was just all hand painted stuff. 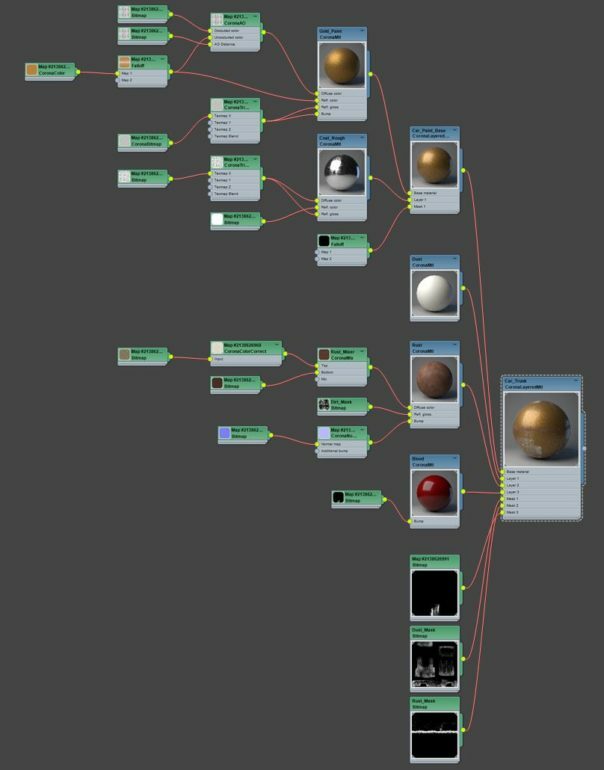 We just did quick unwrapped meshes or straight up planar maps and used Corona’s Layered material to blend it all together. Any particular challenges to creating a scene with people in it? The most challenging thing about this project was rendering everything in single camera move for 1 min. Getting all the lighting to work from day to night and back with no edits and so much geometry to contend with was a personal challenge. The characters are pretty funny. They are lonely archviz models that we made to look like crime lords 🙂 The animations in this are my creative partner and I acting it out using kinect cameras at our studio. We really did not have time to rig and animate them, so we very crudely decided that we can just capture ourselves for this. We then put the Corona skin material on them and called it a day. Since this was a project for a design conference, we had freedom to achieve what we wanted in any way possible. When it came to the final rendering for these two projects, did you use an in-house render farm, or an external render farm? We have moved to mostly rendering with Garage Farm off site. We get excellent support from them and feel like they have our backs. It frees us from the constant fixing / upgrading of render blades! And let’s the pros run that side of things. Who else was involved in the project? 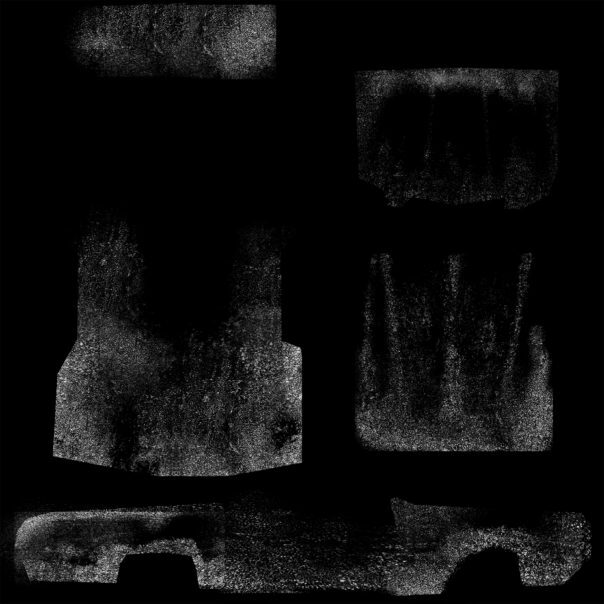 We were fortunate enough to work with our friends at Cypher Audio who created the soundtrack for this piece. You can never underestimate the importance of audio and music in bringing an animation to life. We currently just finished a new spot called “Take the Reins” featuring horse racing for RGC about gambling responsibly. Corona was used for this spot again, and let us incorporate wonderful 2D animation into the 3D scenes. Again using Corona lights and materials with interactive rendering is just so nice. The 2D was animated in AE and Rough Animator. These were then rendered as just an animated texture inside Corona to get all the lighting casted onto it. I really enjoy these kinds of projects of mixing different styles together. We are fortunate to have worked with our small team to create these projects. We feel we have hit a pretty nice sweet spot with what we do, and are looking for people that share the same vision for projects. We will be creating some personal projects outside of just animating films and commercials so I would look out for that in the near future.